Experience Williamsburg and all it has to offer year round. Springtime is a profusion of color. Daffodils lead off blooming for Saint Patrick’s Day. The variety of flowers continue for months peaking in late April during Garden Week followed by the Dogwoods in early May. War Hill Inn is a great family getaway for spring break, plan early and reserve your room. Vacation space is limited during the spring and rooms at War Hill book early. The summer season holds a variety of activities; plenty of daylight to explore Colonial Williamsburg, Jamestown, Yorktown, Busch Gardens and Water Country. At War Hill Inn fireflies hover and glow while a symphony of soothing night sounds from cicadas, frogs and owls serenade you. Fall in Williamsburg brings cool evenings and sunny days perfect for touring and shopping. War Hill is the quiet oasis perfectly located close to all area attractions. During the Holiday Season plan your visit to Williamsburg and finish some early Christmas shopping while exploring our colonial history. The War Hill Inn Bed & Breakfast is a serene escape where you will feel as though you have stepped back in time. This 32-acre estate is located just minutes from Williamsburg’s many historic and entertainment attractions. 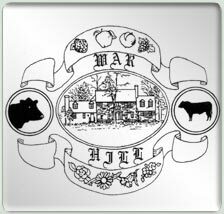 The War Hill Inn is a place where you may relax in the swings under the giant oak trees, stroll the grounds, pick the fruit in season or watch the Angus cattle meander in the surrounding pastures. Perfect for a quiet romantic getaway or a unique family experience, War Hill is affordable with prices ranging from $120 to $190 for double occupancy. Experience the charm of colonial style while staying at the War Hill Inn, an inviting Virginia country bed and breakfast. Ideally located in Virginia’s historic triangle, this country inn will provide you with a relaxing respite from busy days of sightseeing. Trace America's roots with a vacation to Colonial Williamsburg, Jamestown, and Yorktown. Whether you choose your lodgings in the Manor House or one of the quaint cottages, innkeeper Will Lee will make certain that your stay at the War Hill Inn will be a step back in time that will compliment the history you are experiencing during your stay in the area. 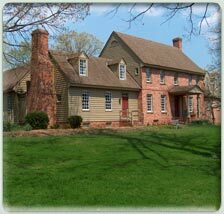 The War Hill Inn provides the ease and comfort of country living while being in close proximity to many attractions in and around Colonial Williamsburg. The four manor house accommodations and two cottages are located on a working farm surrounded by pastures, forests, grapevines, fruit trees, and gardens. These elements, combined with the well-kept grounds and indigenous wildlife, make the Ware Hill Inn a peaceful country retreat . The Lees invite you to come and enjoy this beautiful natural environment on a 32-acre Virginia country estate. The peace and quiet, and the 18th century architecture and furnishings will allow you to escape into a bygone era of America's history.